Sewing is fun, creative and easy to learn. If you want to teach your kids an essential life skill, then you can teach them to sew. Sewing can help them to become incredibly self-reliant, expressive and creative. Sewing machines are easy to use, but some are geared more towards children than others. What is the best sewing machine for kids? Let’s take a look! When you choose a sewing machine for your kids, you’ll want a machine that is high on safety features. You’ll want a machine that is dependable. Most important, you’ll want a machine that will actually help to develop your child’s sewing skills. That’s what the chart below will help you find! What Makes a Good Sewing Machine For Kids? The trick to making the best sewing machine for kids is to combine real features (unlike sewing toys like this one that doesn’t actually use thread) that develop their sewing skills without compromising their safety. One of the first places to look is at the feet of the sewing machine. Do they snap off as a method of changing them? Or do they screw on or attach in a solid way? For kids, look for feet that attach so they don’t catch it just right and feed their fingers in for stitching with their materials. You’ll also want to look for safety features on the included pedal of some models because little fingers can get pinched in their pretty easily. Modern sewing machines also offer options that allow for push-button starting and stopping to eliminate the pedal altogether! If you do get a manual control machine that runs by buttons instead of pedals, look at our extensive reviews to see which makes and models will provide a consistent speed for you. The best sewing machines for kids also do a good job of making sewing fun. Look for custom options on each sewing machine that allow your children to embroider their favorite characters as patterns or include them within the design of the sewing machine itself. When kids have a good time sewing, they’ll naturally want to do it some more. That’s what ultimately leads to better skill development! What Are the Different Types of Sewing Machines For Kids? Most of the sewing machines that you’ll find for kids today are the standard sewing machine. To maximize your investment, think about how many stitches you’ll want them to have. If you only need a dozen or so stitches because your child is just getting started, then you’ll save some money on this initial investment. If your child has already been sewing for a while and is looking for a new challenge, then we highly recommend upgrading to an embroidery-only machine. Keep that standard sewing machine on hand for all of your regular chores! The embroidery machine will help your child be able to get creative with patterns and designs in a unique way that explores their artistic side. Look for a sewing machine that you can plug directly into your home’s Internet connection so that it stays up to date with firmware and available patterns. For kids that are really wanting to go to the next level, and entry-level serger sewing machine could be a good option as well. These machines use multiple threads and are a great way to create a safety hem. If your child is familiar with how to control thread tension and they’re good at getting their current sewing machine threaded, then you can really advance their skills with this type of sewing machine. To determine which machine is the best sewing machine for your child, you’ll need information about the features and advantages of each make and model. That’s where our reviews can really help you out! 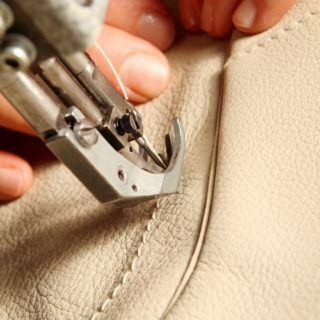 You’ll see the safety features that have been included, what skills can be developed, and if a sewing machine really provides the value which it promises. What Are the Benefits and Problems of the Right Kid’s Sewing Machine? The best sewing machine for kids has one clear benefit: it teaches them an essential life skill. Sewing is something that kids can get started on at an early age, often around 3 or even younger sometimes, and they have fun sitting at a machine that their mom, dad, or other family member routinely uses as well. Sewing also provides a child with an added measure of confidence and self-esteem. So many schools and educational programs are cutting back on their artistic learning programs today and that means kids are getting bored, stale, and uninterested with their imagination. Sewing can bring that back in a fun, useful way that doesn’t take up much of their time if they’re in a hurry. If you’re stuck for ideas on projects that your kids could create on their sewing machine, then this Pinterest board is a great place to start. Sewing is also a great way to make new friends. Not every child sews, so it becomes a natural point of common interest when two kids come together who can sew. It might not be as exciting as a video game, but it will work on hand-eye coordination while providing useful items for their room, home, or friends. As for problems, the primary issue with a kid’s sewing machine will always be safety. Adult machines are geared toward adult fingers, which means the spacing is off for kids. Look for lightweight, compact machines with small footprints to solve this problem rather effectively. What Are the Prices of the Best Sewing Machines For Kids? Most entry-level sewing machines that are kid-friendly can be found for less than $100 on websites like Amazon today. Families are typically going to find a high quality sewing machine that can build up sewing skills within their children for less than $250. If you’re thinking about upgrading your child to an embroidery machine, however, the entry-level models typically come with a starting price tag of about $350. Hello Kitty might not actually be a cat, but she is a little girl with some pretty amazing skills. Your daughter will love the features of this sewing machine and let’s face it – boys who love to sew are going to love it too! 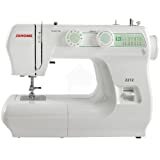 It’s a full-featured sewing machine that has plenty of strength to get any sewing job done quickly and efficiently. Perfect for the beginner and just right for those who know their way around a sewing machine, this lightweight beauty would make a high quality addition to any home. That’s why it receives one of our strongest recommendations today as the best sewing machine available for kids right now! If your child is into fashion, then what better way to encourage their skills than a sewing machine that is inspired by Project Runway? It has a remarkably bright working area thanks to the LED lighting that has been included. This lets you see your stitching patterns on the darkest of fabrics with ease and that translates to better results every single time. You can even sew in the dark if you really wanted to do so with this sewing machine! 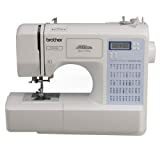 It truly is one of the best sewing machines at this price point and for that reason, we have no hesitation in recommending it to you today for your children. If you’re looking for a sewing machine that has a lot of frills, then this isn’t the sewing machine for you. If, however, you’re looking for a machine that can teach you the basics of sewing in a first-hand way, then you’ll love the Janome 2212. It has a drop feed for free motion sewing and the table area is wide enough that you can do some basic quilting as well. It’s small and compact too, which means you won’t have to dedicate a lot of space in order to use this machine. This sewing machine might appear to be a miniature, but it has some amazing value to it if your kids are just learning how to sew! It offers 2 different speeds and double threading so that your kids can learn the control they need for any sewing project. It’s capable of sewing anything from silk to denim and is powered with a foot pedal or hand switch at you or your child’s discretion. It’s value priced, so it won’t do everything a full-sized sewing machine can do, but it will begin developing their skills quite effectively. This is a highly affordable multipurpose sewing machine that offers reverse sewing and double speed options for your kids. 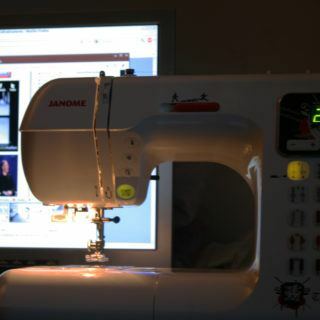 It is an upgrade from other Michley models because it can sew sleeves and ofers an automatic thread rewind. There’s an LED light for bright night sewing and this sewing machine comes with all of the supplies your child will need to get started. 8 built-in stitch patterns will help your child find their sewing creativity as well, making it one of the best sewing machines for kids today. If your child is interested in sewing or wants to explore their creative side in a unique way, then one of the best sewing machines for kids is a great place to get them started! With options that are highly affordable and safety features that keep fingers safe, your kids are bound to have a great time making something wonderful. It’s a life skill that will always pay off!